Whenever the UK legacy media can no longer cope with serious political events (and it doesn't take very much for that to happen) it retreats from reality into its comfort zone and starts indulging in speculation about reshuffles, changes in leadership, general elections or some such. With the Brexit story splintering, the diverse possibilities taking us in a myriad of directions which defy easy (or any) analysis, this seems to be happening at the moment. Stories circulating veer from predictions of Mrs May's imminent resignation, to tales of a full-blown palace coup. By Monday morning, we thus expect (virtual) tanks to be parked on Parliament Square – so recently vacated by the Stop Brexit march that the litter hasn't yet been cleared – with any one of a number of actors, ranging from Nicky Morgan to Michael Gove ensconced in Downing Street as our new prime minister, while workmen pile Mrs May's chattels in the garden. In the latest iteration, "senior ministers" are moving to oust Mrs May and replace her with her de facto deputy, David Lidington. In a frantic series of private telephone calls, we are told, senior ministers have agreed that the prime minister must announce she is standing down, warning that she has become a toxic and "erratic" figure whose judgment has "gone haywire". Actually, even our lot aren't that brutal, but even the earlier reports had it that Mrs May was "under pressure" to name a date for her departure, with suggestions that her departure might be imminent. Cabinet support was said to have "drained away", the DUP had made clear its lack of faith in her and even her closest allies were claimed to believe that it was "inevitable" she would have to resign. "It's obvious that this is where things are headed", these helpful anonymous sources said. Meanwhile, David Lidington – in between standing by to replace his boss - had held talks with opposition leaders about votes on alternatives to her Brexit deal, while the media is stuffed with gurus fantasising about different versions of Brexit in the certain knowledge that none of them will ever have to be put to the test. It is both instructive and interesting that almost the entire media establishment has rounded on Mrs May as the fount of all our problems, but that does save it from having to accept any responsibility for its own part in this ongoing debacle. Ditching the current prime minister would cast her admirably in the role of the scapegoat, whence she could take with her the burden of the collective's sins as she was pitched over the precipice. The arrival of a new prime minister might also be taken by the "colleagues" as a signal for a fresh start in the Brexit drama, allowing issues to be broached that had been previously so tinged with red as to be off-limits. With one fell swoop, therefore, every problem in the world is instantly solved by the single expedient of a new face at Number 10. The ever-so tiny fly in the ointment of this creative endeavour is that, in all probability, Mrs May hasn't been consulted about her new non-role and, given a choice, has no intention of booking a furniture van any time soon. And, with the year not yet up before there can be another Tory "dump the leader" move, there is no procedure short of a successful vote of no confidence that can be used to depose her if she doesn't want to go. There could be a distinct possibility, therefore – verging on a racing certainty – that speculation on our revered leader's imminent demise is somewhat overheated. Come Monday, we can expect to see her in the House, delivering her verdict on last week's European Council and issuing the MP collective with its next homework assignment. That would then leave Jeremy Corbyn to chance his arm with another vote of confidence, this time in the hope that the DUP and a number of Tories will desert the ship of state and allow Labour to form a government. As yet, there is not so much a fly in this ointment as a bluebottle the size of a house brick. Within the Labour ranks, there is no more clarity about Brexit than there is within the Tory factions, who themselves would be hard put to agree on anything, with or without a new leader. Currently, it seems, Corbyn's inner circle is "warming" to the idea of a "Norway-style" Brexit (not to be confused with the Norway option), while other activists are intent on pushing for a second referendum, which may or may not include a "get back into jail free" card, allowing the UK to stay in the EU. In other words, the chances of any coherence coming out of the Corbyn camp is precisely nil, which would rather defeat the purpose of chucking out the Tories and replacing them with a coalition of opposition parties. There would not only be Labour to take into account, but also the tender sensibilities of the SNP – who could go any direction under the sun, and twice on Thursdays. Bearing in mind that, if any of this is to happen, it must be done and dusted before 12 April – in the event of there being no third vote on the Withdrawal Agreement. There must be time for any new leader to cobble together a new proposal to submit to Brussels, and build a caucus of support in the House of Commons, sufficient to convince the "colleagues" that it can be made to stick. In reality, such is the febrile atmosphere in the House that, even if the genuine Mother Theresa was teleported down from Heaven to take charge, she would have trouble getting a single plan to stick. She may have taken vows of chastity, poverty, and (especially) obedience, but none of the MPs have. Thus, on the current timetable, unless Mrs May actually puts the Withdrawal Agreement to MPs by Friday and gets it approved, we're looking at the 12 April deadline kicking in, with that actually becoming the date for a no-deal Brexit. Even now, the term "default" doesn't seem to have gelled with the bulk of the MP collective, but that is distinctly on the cards. The point here is that, even under the best of circumstances, it would take a heroic effort to pull together a consensus which could then be used to convince the "colleagues" that there is a tenable game plan, sufficient to justify a further Article 50 extension after 12 April. Any such effort would require absolute focus, and a determination to bring together all the warring factions to discuss and agree a common position. Yet, in reality, fragmentation continues, while the bulk of the attention is on internal power plays, consigning Brexit arguments to the status of background noise. Looking at the UK from their perspective, EU leaders must doubtless be scratching their heads in wonderment. When the country now has less than three weeks to come up with a plan to avert a highly damaging no-deal Brexit, they might have expected a vibrant debate to be spilling over into the media this weekend on how to divine a way forward. 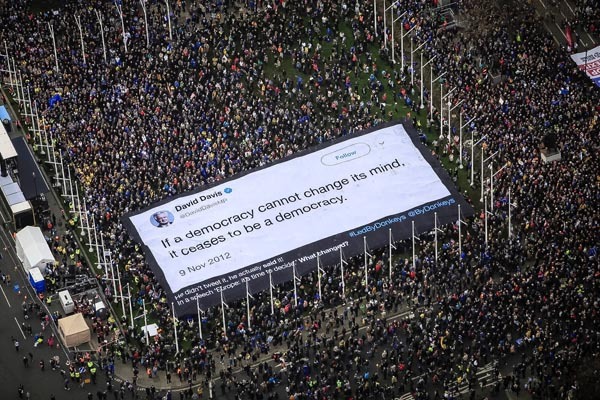 But, if that was the expectation – and not an unreasonable one at that - it would have reckoned without the venality of the UK legacy media and the willingness of Westminster politicians to allow themselves to be distracted. And since these dynamics have played a considerable part in creating the current mess, it is unlikely that we are going to see an improvement any time soon. One senses that this realisation is dawning on the "colleagues" and that they are ready to cut us loose. There must be a limit to their tolerance for the messing about that they are seeing in London, and an awareness that there is not going to be a negotiated resolution. Sooner or later – and sooner rather than later – they will need to take the decisive action that the UK system seems incapable of taking. The only good thing we have to look forward to is the end of the tedious re-runs of the referendum debate, and the calls for a people's "Stop Brexit" vote. Once we are out, on whatever terms, there is no going back, short of making an entirely new application to join, under Article 49. No sooner is the UK gone, however, than the Member States will be looking to a new treaty, creating a divergence that will widen the gap even if the UK stands still. Perhaps that is why we are seeing such frenetic activity from the marchers. In their bones, they must know this is their last hurrah, the closest they will ever come.